Angelina Jolie is pitch perfect as Maleficent, the iconic villain best known for cursing Sleeping Beauty to take film history’s most famous afternoon nap in the 1959 Disney animated classic. The production in this live-action “revisioning” of the tale sparkles with breathtaking visuals and make-up and production design that’s sure to garner Oscar attention later this year, and Jolie herself commands the screen the way you’d expect her to in this sort of material, with grace, charisma, and at times terrifying majesty and power. 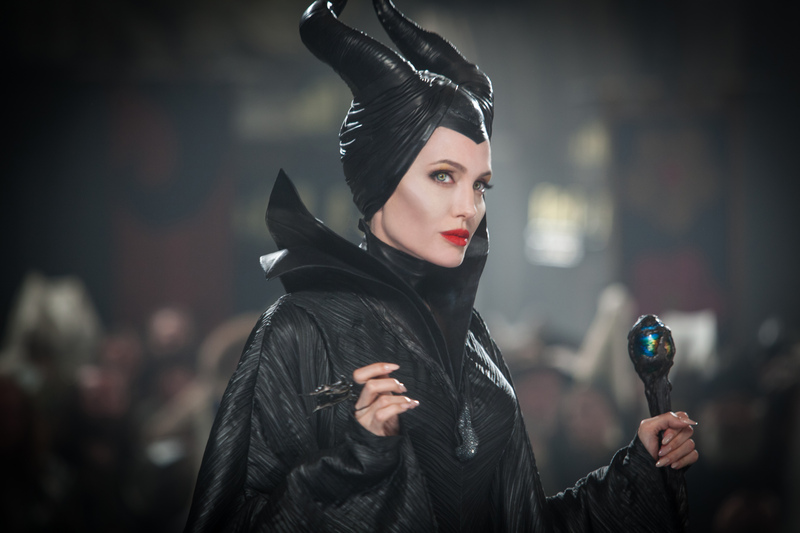 But what may prove to be the downfall of this take on the well-known fairy tale may just be placing Jolie’s character, a villain perhaps most memorable for just how much a pure personification of evil she is, at the film’s center. In order to tell an engaging story with a fully-developed character arc, the screenwriters here choose to complicate Maleficent’s story, to give her reasons for her unreasonable wickedness, and in so doing end up rendering a story that’s not nearly as dark as audiences may have expected it and hoped for it to be. The film’s story begins many years before the birth of the Princess Aurora, when the gentle and kindhearted Maleficent (played in her youth by Isobelle Molloy) has her first encounter with a human urchin that wanders into the magical moors that she calls home. Though humans had long hated and envied the denizens of the moors for how beautiful their lands were, Maleficent and the boy become friends, and eventually, as they grow together to adulthood, that friendship becomes intimate. But their disparate worlds and natures eventually divide them: Maleficent becomes the moors’ most powerful and visible defender from the greed of the human kingdom, while the boy, Stefan (Sharlto Copely), follows his ambitions all the way to the royal court. Stefan does become king, as those who remember Disney film already know, but in doing so he commits an act so heinous and unforgivable that it turns his childhood friend Maleficent into the bitterest and cruelest of enemies, someone so evil that years later she could gleefully curse Stefan’s innocent, newborn daughter on her christening day. From here, the film makers take audiences into familiar territory: the christening ceremony in the royal throne room, the destruction of every spinning wheel in the kingdom, Aurora being placed in the care of three well-meaning but hopelessly inept pixies, Knotgrass (Imelda Staunton), Thistlewit (Juno Temple), and Flittle (Leslie Manville), who agree to raise the princess hidden away until after her sixteenth birthday, and the young princess’s fateful encounter with a spindle needle. But it’s also here that the film takes its biggest turn away from the story told in the animated film, leading to a conclusion in which yes, the villain is vanquished forever and true love prevails, but not nearly in the manner to which audiences might be accustomed. Director Robert Stromberg, who once upon a time (heh, see what I did there?) won Oscars for art direction for his work on James Cameron’s Avatar and Tim Burton’s Alice in Wonderland, makes his directorial debut here, and he brings his eye for crafting marvelously vibrant magical fantasy worlds to life to this production in full force. Considering his rookie status as a director, his efforts are solid here, and at times more thrilling that what we’ve seen in comparable fantasy works cranked out by more experienced directors. The many sequences when Maleficent takes flight, and the battle sequences that dominate the film’s opening and closing acts, each are handled with style and verve, and they speak well of Stromberg’s talent. He’s not the problem here. Nor is the problem Jolie or the cast backing her up, which includes Elle Fanning (Super 8) as the grown-up Princess Aurora (Jolie’s own daughter Vivienne plays Aurora as a toddler). In visage, bearing, and voice Jolie is more mesmerizing as Maleficent than she has been in any other role in years; she validates the casting choice from the moment she appears. Fanning, on the other hand, is every bit as bright and shining as her role demands her be, and she’s a winsome counterpoint to Jolie’s dark and vengeful fairy queen. Even Sharlto Copely, who after his starring breakthrough in District 9 is making a career out of playing antagonists (this is his third role as a heavy in a major production, following 2013’s Oldboy and Elysium), turns in solid work as Stefan, whose tragic connection to Maleficent is the real driving force behind the whole tale. The issue here is the effort to transform a character that’s been beloved for decades by generations of Disney fans for being a terrifying embodiment of wickedness into a sympathetic and understandable figure. 2012’s Snow White and the Huntsman attempted this same feat on a smaller scale with its villainous queen, and though Charlize Theron was easily the most interesting character in that cinematic misfire, the fact that it was done at all suggests that film makers today, in an effort to adapt classic stories for modern audiences, simply do not trust in how compelling an antagonist who is evil for evil’s sake can be. These days there must be method to the madness, a wrong committed that gave birth to villainy, and while most times that’s a good thing, there are times when it’s unnecessary to muck things that already work well with complications. Or perhaps in this case screenwriter Linda Woolverton (The Lion King, Alice in Wonderland) simply felt that as the main character in a film that by definition is geared more toward female audiences Maleficent had to have more to her than just hellfire and hatred, that she had to have something in her that audiences could connect to, in order to keep the film compelling. 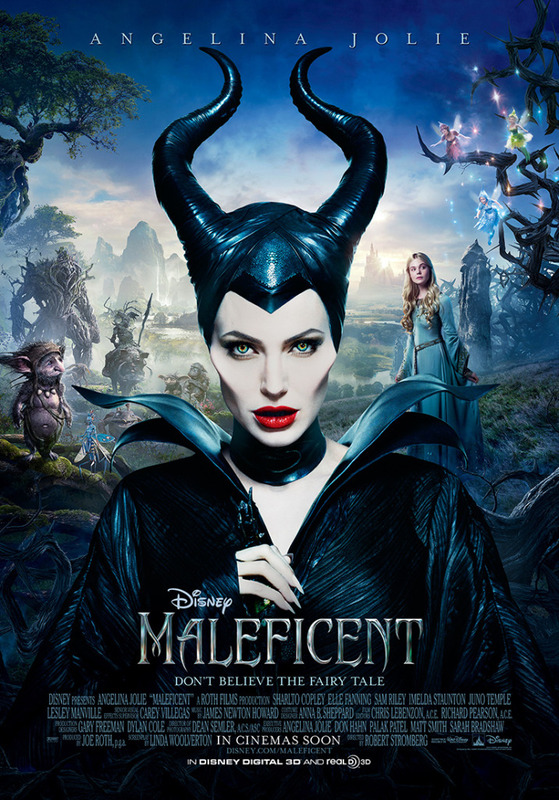 Regardless of the rationale, the end result is a character that, while well realized and brought to life by Jolie, is just far enough off from the classic villain that devoted fans expect to see that it may just turn off the audience that Disney is no doubt counting on to make this film a worldwide hit: the generations of women who as girls loved and feared Maleficent and will be first in line to buy premium tickets. Jolie herself claims to be one such woman, and so its ironic that she didn’t recognize the inherent danger in changing the character even slightly, that she as an executive producer on the film and the other film makers were tampering with what drew her to the character years ago in the first place. Starring Angelina Jolie, Sharlto Copley, Elle Fanning, Sam Riley, Imelda Staunton, Juno Temple and Lesley Manville. Directed by Robert Stromberg. Rated PG for sequences of fantasy action and violence, including frightening images.